ZOTAC this past week formally introduced its first family of upgradeable small form-factor desktops for gamers. The ZOTAC MEK1 systems will come in two configurations, each featuring Intel’s Kaby Lake CPUs as well as NVIDIA’s Pascal GPUs. The MEK1 systems use off-the-shelf components and therefore can be easily upgraded by end users when they need to. 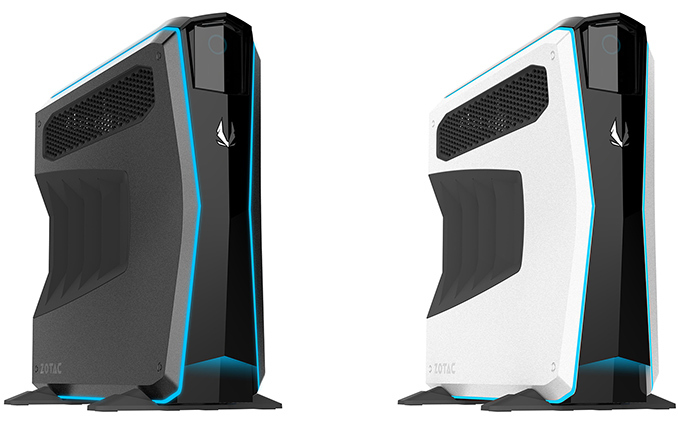 The ZOTAC MEK1 Gaming PCs will come in Black and White chassis themed after “future robotics and mechanical anatomy”. Both systems are based on the same Mini-ITX motherboard featuring Intel’s B250 PCH, they are equipped with 16 GB of dual-channel DDR4-2400 memory, a 240 GB PCIe 3.0 x4 SSD, as well as a 1 TB 2.5” HDD. Meanwhile, the MEK1 Black model is equipped with Intel’s Core i7-7700 processor as well as ZOTAC’s GeForce GTX 1070 Ti graphics card, whereas the MEK1 White is powered by the Core i5-7400 and the GeForce GTX 1060 6 GB. ZOTAC’s MEK1 systems rely on air cooling and take advantage of carefully managed airflows inside the case. The graphics card is installed above the compartment with the CPU and M.2 SSD, so its heat does not affect said devices. When it comes to connectivity, the MEK1 Black and the MEK1 White systems are identical: they have an 802.11ac Wi-Fi + Bluetooth 4.2 module, two GbE controllers, six USB-A 3.0 ports, two USB-A 2.0 connectors, one PS/2 input, one HDMI 2.0b output, a DL DVI-D header, three DisplayPort 1.4 outputs, analog and S/PDIF audio connectors and so on. For some reason, ZOTAC decided not to equip its MEK1 desktops with USB 3.1 Gen2 Type-C connectors that are present on a number of its other products (1, 2). Some might say that there are not a lot of USB-C peripherals just now, but when you design a PC, you have to think about user experience throughout its lifetime of at least three years. If customers do not enjoy it at the end of its lifespan, they may not come back to ZOTAC for a new one. Meanwhile, USB-C will be widespread three years down the road. Following the latest trends, both MEK1 PCs feature ZOTAC’s Spectra RGB LED lighting that can be customized using a special utility. To complement the design, MEK1 desktops will come a mechanical keyboard and an optical mouse that match their colors and feature built-in lighting. Dimensions Height 393.7 mm | 15.5"
Depth 414.02 mm | 16.3"
Width 118.11 mm | 4.65"
Originally a maker of video cards, today ZOTAC is well known for its compact gaming and office systems. 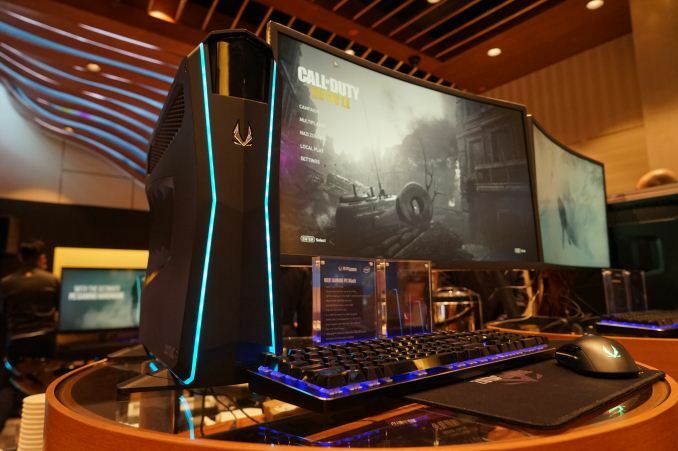 The company’s lineup of PCs is very broad and includes models featuring Intel’s Core i7 CPUs and NVIDIA’s high-end mobile graphics solutions that deliver performance comparable to that of desktop GPUs, but at a lower TDP. Unfortunately, such systems are hard to upgrade because NVIDIA does not allow partners to sell MXM modules to end-users. Therefore, to address people who might want an upgrade path for their PCs, ZOTAC developed its MEK1 systems trying to bring together performance, upgradeability and compact sizes while keeping the price in check. Obviously, some compromises had to be made. To keep the system sleek, ZOTAC had to use processors with up to 65 W TDP and avoid Intel’s unlocked models that generate up to 95 W of heat or more. Since Intel is gradually increasing performance of its CPUs, TDP constraint is not a problem per se. Since the company uses a motherboard based on Intel’s B250 PCH, the MEK1 systems cannot support Intel’s six-cores Coffee Lake process, eliminating any upgrade options for the Black model and limiting them for the White SKU. One of the reasons why ZOTAC had to choose the Kaby Lake/B250 combination was timing — the desktops have been in development for quite a while. Another reason is availability constraints of Intel’s latest CPUs. ZOTAC’s parent company PC Partner can develop an Intel Z370-based motherboard relatively fast, but if it does not have enough CPUs, ZOTAC cannot sell product, so the safe bet is to go with the Kaby Lake. The GPU upgrade path is of course considerably simpler — graphics processors to be released in the coming years will be compatible with a PCIe 3.0 x16 interface. Obviously, the MEK1 can accommodate only compact video cards, but they are not rare this days and the system’s 450 W PSU should be enough even for products like the GeForce GTX 1080 Ti (assuming that it can fit in). As for DRAM, M.2 SSD and HDD, their upgrade is as simple as installing new components into an appropriate slot or bay. ZOTAC plans to start selling its MEK1 systems in the coming weeks. The company did not disclose pricing, but we have reached out ZOTAC and will update the story when we get the information.